The war on fat is decided in the kitchen. Tony realized this immediately and took advantage. He played a numbers game dominated by statistics and won! Now his body is sculpted art! As a swimmer growing up, fitness was just there for me - although I never worked that hard at it. I severely broke both the tibia and fibula in my right ankle in 1996. After swimming (and many surgeries on my right ankle), I spent 15 years of my life doing relatively little physical activity, but I was always able to "get by" because I was naturally athletic from my childhood. My unhappiness with my body peaked sometime in 2011, and I realized that, at age 31, I needed to make a change. The more I thought about it, the more enraged at my situation and my own apathy I became, and that fueled my passion to research. I was not proud to look in the mirror. I was not proud to take my shirt off. I was not proud of what I let my body look like to my family and friends, and to myself. I never thought I'd ever get fat; I thought I could always just "get by." Well, reality is harsh, and so are my "before" pictures. I was a mess, drinking every weekend, eating anything, anytime, and never so much as thinking about a gym or a workout. I went to a gym probably 10 times in the past 10 years, and those outings were pretty much jokes. I realized that I owed it to myself, my wife, and our future - I had to change my life. Research, research, research. Then, application. I was always a math and science guy, so I took to the numbers part immediately. I learned what my LBM (lean body mass) was, what my body fat percentage was (20 percent!) and what my daily maintenance calories and macronutrients were. 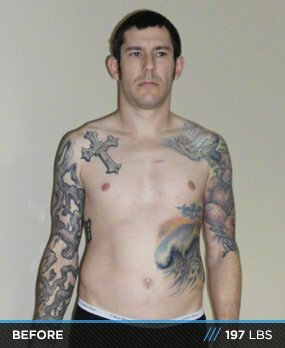 From reading the Forum here on Bodybuilding.com, and with the assistance of my wife, who is an absolutely amazing cook, I was able to get my diet straightened out very quickly. At the start, I was 197 pounds and 20 percent body fat. So, my LBM was 157.6. My daily maintenance calories were 2250, my daily fat grams target was 71. On workout days, I would consume 500 calories more than my daily maintenance calories, filling the additional calories with protein and carbs. On non-workout days, I would consume 300 calories less than my daily maintenance, reducing the carbs and sometimes the fat. Also on the Forum, there are recipes for things like protein cheesecake that fit well into daily caloric and macronutrient counts that greatly helped with any cravings. I knew if I was stringent with my diet and worked as hard in the kitchen as I planned to in the gym, things would be easier. I often read that fitness is 80 percent kitchen and 20 percent gym, and I believe it's even more in favor of the kitchen. The gym part was tough at first, getting sore every day, but I worked out like a madman. When I'm in the gym, I'm going 110 percent the whole time. This is also why I was so good in the kitchen; I was NOT going to waste any of those workouts! I was able to tailor my daily training on my own with the information on this website. There are videos showing nearly every exercise you can think of, and they show proper form. I combined the elements of lifting heavy with low reps, lifting light with high reps, Crossfit, circuit training, and brutal ab and oblique routines. I found that due to the intensity of my gym time and tight diet, I was able to completely remove cardio, which is excellent for someone with such a bad ankle. I monitor each workout with a heart rate monitor, so I can see how I recover, what I peak at, and when, and what my heart rate average is for the entire time I'm at the gym. 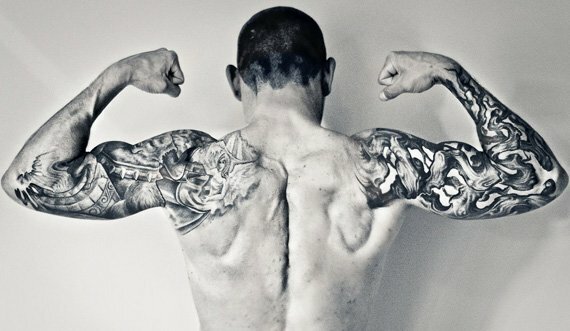 Muscles really bring out the tats! I work whichever muscle group needs the most work, or one I think needs to be brought up more. Also I typically do an ab or oblique circuit. As dedicated as you are inside the gym, you should be doubly dedicated in the kitchen to get the results you are looking for. Why work so hard in the gym, only to not work that hard in the kitchen? You're shooting yourself in the foot, and then you end up wondering why the results aren't there, when you've been "working SO hard." Well, if you are only working hard in the gym, think about how many hours each week you are not in the gym. If you spend five hours a week in the gym, then you spend 163 hours outside the gym each week. Use that time wisely. Learning to identify what your LBM is and what your daily maintenance calories and macronutrient requirements are will help you tons more than that extra set or rep.
Don't cheat! By that I mean, don't totally disregard your diet on any day. What you should do instead, is fit "cheat" foods into your diet once in a while. If you want some pizza, have some, but track the calories and macronutrients. If it means you have to eat lighter on a different meal that day, you're still eating what you want and you're not exceeding your calories and you're hitting your macros. Calories in vs. calories out works 100 percent of the time if you're 100 percent honest with yourself 100 percent of the time. Smiling is allowed in bodybuilding. First, I have to thank my wife Jami, she's an amazing cook who tailors meals to my requirements. We eat only naturally raised meats and line caught fish, organic farmer's market veggies. She also puts up with me on low-carb, low-calorie days when I'm slightly ornery. Thanks to my training partner Matt McGorry and my friend Phil Keister who got me into the gym in the first place. Thanks to all of my friends on Bodybuilding.com, you keep me inspired daily. Thank you to Bodybuilding.com for all of the information, supplements, and support I've used to get where I am today. ON, BSN, MusclePharm, you guys are my favorites.